What is the best approach for shoulder pain? Shoulder pain is common yet poorly understood in most instances. 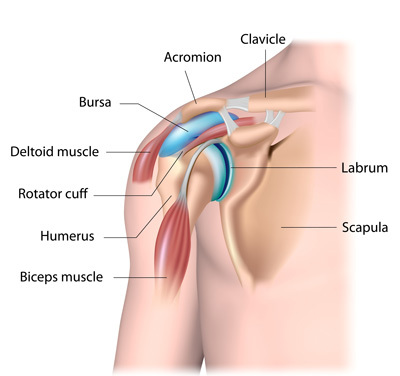 Some shoulder pain diagnoses are quite easy to make, for instance fractures of some kind, acromioclavicular joint pain, or a complete rotator cuff tear. However the majority of the time patients complain of a pain in the front of the shoulder that is it difficult to trace to one structure. Commonly a few physical examination maneuvers are performed and the patient may be told that they have an “impingement syndrome”. These physical examination maneuvers are performed to see if the supraspinatus tendon is rubbing on the undersurface of the acromion and the coracoclavicular ligament. If this is thought to be happening the patient may be referred to physical therapy for strengthening and “scapular stabilization” exercises. If the pain is severe and chronic a referral for surgery which resects part of the acromion may result. However, the thinking of all of this appears to be very shallow, for the reasons I will explain below. When an individual injures their shoulder there is a source of this pain that must be treated. This is an acute injury and should be conceptualized as a new structural change. What do strength and exercises have to do with this injury? If a “muscle imbalance” is to blame for the pain why did it not happen earlier?—this imbalance must have been ongoing for some time, for strength does not rapidly change. The individual will state however that the pain started only after a specific activity or injury, i.e. the activity injured a structure of the shoulder joint complex causing an abnormal physiology to occur. It does not seem reasonable that a muscular exercise is the treatment for a non-muscular injury. Regarding surgery, this is equally foolish because the patient has had the same bony structure through childhood and adolescence. If the muscle tendon is impinged under the bone, there must be a new abnormal physiology on the function of the shoulder. It again seems obvious that this abnormality should be corrected instead of a shoulder surgery. How much strength is actually used to raise your hand in the air? The answer may surprise you. You, in fact, are not using much of your strength when raising your empty hand in the air. Over 50% of your muscle units can be absent and you will still have anti-gravity strength. Exercise absolutely builds strength, but the painful person will not be using it for this simple test! The diagnosis must be made through an exam that looks at the range of motion of the shoulder joint. Capsular injuries limit motion! Abnormal motion translates to abnormal physiology at the joint level. You must attain the normal range of motion for the joint.